Freemasonry is a beautiful system of morality, veiled in allegory, and illustrated by symbols.“ -Hemming. "Symbolism is the language of the Mysteries; in fact it is the language not only of mysticism and philosophy but of all Nature, for every law and power active in universal procedure is manifested to the limited sense perceptions of man through the medium of symbol. Every form existing in the diversified sphere of being is symbolic of the divine activity by which it is produced....In a single figure a symbol may both reveal and conceal, for to the wise the subject of the symbol is obvious, while to the ignorant the figure remains inscrutable...." -Manly Hall . The eye towers over the bricks. Notice the light emanating from the eye in the triangle: The eye and the triangle both represent a tower: The eye also represents a light source. The light that emanates from the eye represents the knowledge (illumination) that comes from the eye: Just as the earthly sun is above our planet and sustains all life on earth and gives them light, the eye also abides above the bricks and gives them light (illumination) Therefore, it is representative of a spiritual sun that sustains the collection of bricks below. i.e gives them 'light' and sustenance. Now ask yourself: What happened when Eve ate of the forbidden tree? The answer to that question is she changed, from a heavenly and divine being to a terrestrial, carnal and rebellious (against the commandments of God) being whose "eyes were opened". This change signified the creation of a new world order (she and all her future seed became "new" beings, i.e sinners). 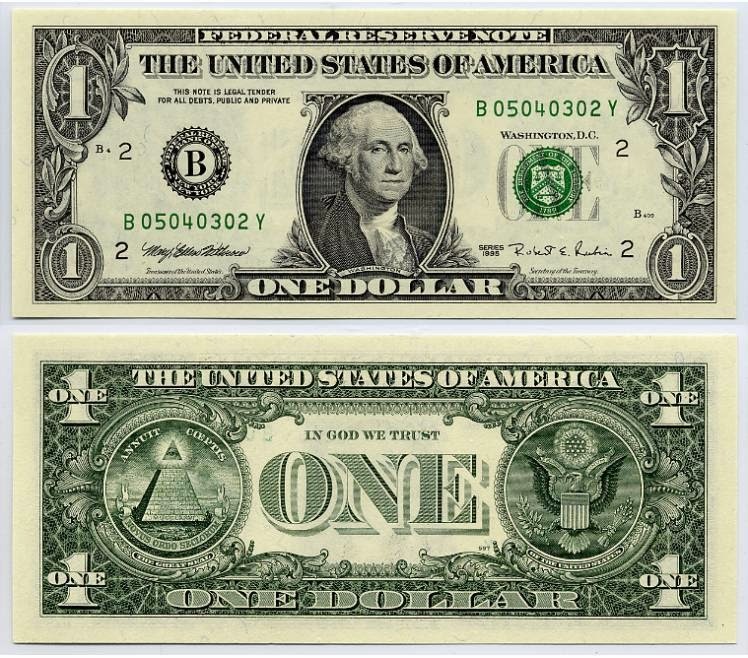 That is why the words Novus Ordo Seclorum (New Order of Ages) are written below the bricks. This inscription signifies the creation of a new world view. (A new consciousness in Humanity). -Matt 6:22-23:"The light of the body is the eye: if therefore thine eye be single, thy whole body shall be full of light.But if thine eye be evil, thy whole body shall be full of darkness. If therefore the light that is in thee be darkness, how great is that darkness! " 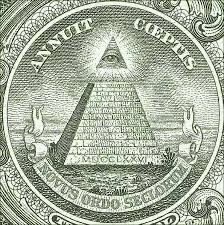 The eye above the pyramid represents the forbidden tree that man was forbidden to eat from: Satan is the base mind (eye) that cuts man off from the Divine mind of God and prevents him from perceiving the truth. The light from the eye is the fruit that God forbade man from eating (partaking of) i.e The eye is the source of the light, the same way the tree was the source of the fruit. When we eat of (are illuminated with) the satanic light (knowledge), it opens our carnal understanding and conforms us to the corrupted image of satan (The eye above, Gen 3:7, John 8:44). When the heat from the kiln (or the sun) burns up the brick used by stone masons, it makes the bricks harder and makes them last longer. In the same way, when this 'light' burns the minds of the world, it makes them become more hardened in their desire to rebel against God and unwilling to accept the Christian worldview. Proverbs 18:10 says :"The name of the Lord is a strong tower the righteous runs into it and is safe"
This name symbolizes an image. i.e The meaning of most Biblical names reflected the character/image/nature of the person who bore them e.g Jesus (Matt 1:21), Nabal (1 Sam 25:25), Abraham (Gen 17:5) etc So in other words, what they were trying to say is :"Let us make an open eye (god conscious) image in humanity and let this image unite us all as brothers." (Gen 3:5). The verse above also goes on to say: "the righteous run into it (the tower) and is safe." The meaning of this is that we are safe from God's wrath when we see with His eye, (mind, spirit i.e conform to His image: Psalm 32:8). In the same way, when the new world order that mystics are constructing is in place, only those who conform to it would be acceptable. "Let us establish the god conscious (open eye, exalted) state that satan promised Eve to rule over and subsequently elevate the earthly man (bricks below) to the god conscious state promised by Satan our father". The process of making themselves and subsequently the rest of humanity bear this satanic image (through social engineering) is what occultists refer to as the Magnus Opus or the Great work. When they saw with their own eyes, they saw a false reality: Their naked selves. Fact is when their eyes were 'open', they lost sight of the truth: The God who covered them. But what those who are fooled to accept this image fail to realize is that it blinds them from seeing their need for God: The truth. That is why the Bible says in John 9:41:" Jesus said unto them, If ye were blind, ye should have no sin: but now ye say, We see; therefore your sin remaineth." Seeing with our own understanding is what blinds us to the truth of God and makes us sinners. It is only when God "blinds" our carnal/satanic understanding which satan has deceived us to embrace and opens our spiritual eyes with His light that we would be able to see who God really is and who we are really supposed to be. And that is why Is 42:19 says:" Who is blind, but my servant? or deaf, as my messenger that I sent? who is blind as he that is perfect, and blind as the LORD's servant?" 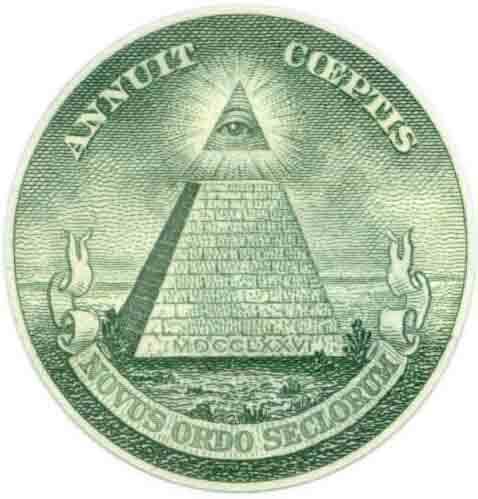 The annuit coeptis above the eye is a Latin inscription that means "Announcing the conception." This means when the eye is conceived in humanity, a new world comes into effect, one that is aware of the image of sin that inhabits humanity. From the point of Light within the mind of God (their god satan), let light stream forth into the minds of men. Let Light descend on Earth......Line Taken from the Great invocation, a mantra which Alice Bailey claims was given to her by Djwhal Khul. "Hail to thee: Lucifer! The Light of Illumination. For it is by thine Eye doth my "own mind take sight.Thy kingdom come, thy Will be done so Below as it is so Above. Take note of the fact that the prayer also says so below as it is so above. This confirms my earlier statement that luciferans want all who are below the tower to conform to the eye that towers above. 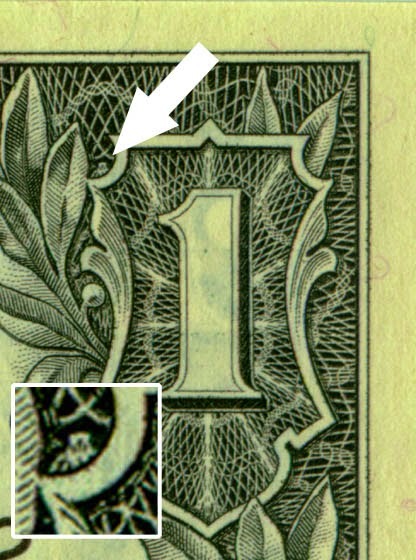 There is a small owl just to the left of the "1" which appears on the upper right hand corner of the Dollar Bill. But what does the owl symbolize? The owl is a symbol of wisdom. Owls can see in the dark. They can see what we cannot see. Likewise, the Illuminati (all mystics) are privileged to information that is hidden from the general public (the uninitiated). The Pythagoreans believed that the source of all truth was hidden in geometric symbolism, with the triangle regarded to as the most sacred of all symbols and the key to unlocking all hidden wisdom. Placing these values in their respective positions of importance, the first Roman numeral of each group being placed as the capstone and the remainder being placed at the base of each pyramid, ... gives a trinity of 3 symbols each: MDC, CLX and XVI each of which is in descending sequence for 1600, 160 and 16 in Arabic numbers. The initials of this unholy trinity are the top numerals MCX which adds up to 1110 while hidden as the remainder are the base numerals DCLXVI, or 666. In the Babylonian sexagesimal system (base 60) 1110 (x 0.6) also becomes 666. So when using the triangular method and the Babylonian and Roman number systems to decipher the resultant digits, we would arrive at the number 666. The Bible says in 1 Cor 3:11:"For other foundation can no man lay than that is laid, which is Jesus Christ." Jesus Christ is the foundation of God's order i.e: Christians are built on Christ and His principles. And that is why they are all conformed to His Divine image and live to seek His glory. The idea that humanity doesn't need Jesus Christ to save them but can save themselves by looking within themselves to solve all their problems and bring themselves to wholeness (Gen 3:5) i.e it is built on secular and humanist values with the aim of making humanity rely on self works and their own ideas and inner abilities to improve and save themselves i.e exalting the self over Jesus. And that is why everyone in this order is self reliant, carnal and live to seek glory for themselves. Also, if you carefully count the bricks in the picture, you would notice that they are 72 in number and that they are arranged in 13 rows. Spiritually speaking, 72 symbolizes the nations of the earth. 13 is the number of man playing god (6 number of man + 7 number of god). * 13 granite stones in the Pyramid. * 13 letters in Annuit Coeptis. This symbolizes the fact that the objective of the war is to destroy all divisive civilizations and to usher in a new era of "peace" and oneness: Creating a common enemy for the world and uniting them to fight against it is the path they choose to unite the once divided world and by this usher in a New World order of oneness and cooperation (Hegelian Dialectics). It should also be noted that the Eagle has 32 feathers in its right wing, but 33 in its left wing. The 32 feathers represent the number of ordinary degrees of the Scottish Rite, and the 33 feathers representing the 33º of Freemasonry. The tail feathers number 9, the number of degrees in the York Rite. 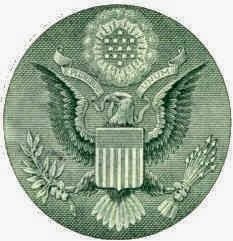 The eagle itself is a prominent icon of Masonry, being used extensively in the Scottish Rite. 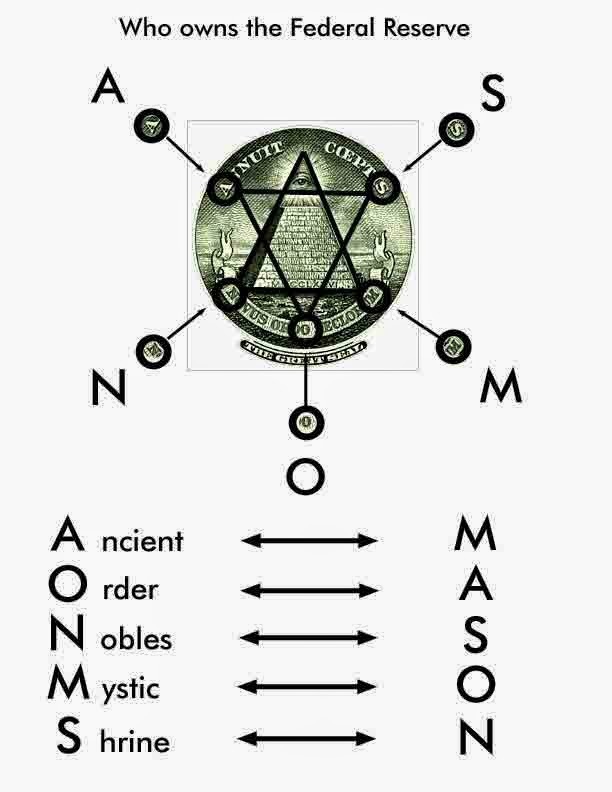 Also, when a hexagram or Magen of David, a powerful tool used by pagans to invoke Satan is placed over the image, one of the anagrams of all the letters that point to each of the the sides of the hex is the word : "Mason" which shows that it is the masons that construct this order. The upper side of the hex points to the eye meaning that the masons build with the guidance of the light from the eye above. i.e the masons interact with satan and follow his guidance in order to change themselves and the world. Note: The reason why the pagans believe that the hexagram invokes satan is because the Hexagram represents the interaction/union of the two opposite forces in nature i.e Spirit (above, satan) and Soul (below, man) in order to produce a new child (change in consciousness,nature) in humanity. Also Note that Alchemists (and many secret societies) call the Magen of David the Seal of Solomon and the reason why they call it the Seal of Solomon is certainly not because they have any regard for King Solomon in the Bible.